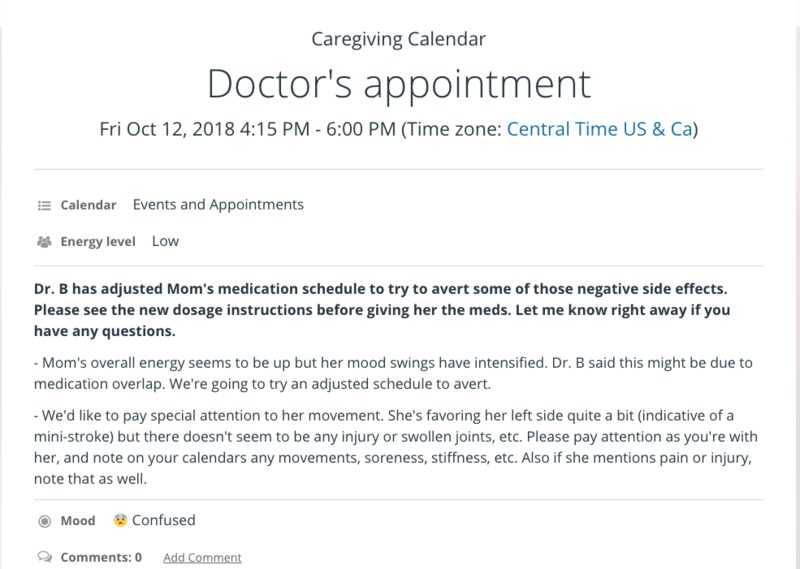 With Teamup, you can create a caregiving calendar that simplifies scheduling, medical notes, and keeping track of medications and more. There are many types of caregiving, beyond the examples including here. And different types of caregiving will have different types of information, scheduling, requirements, and resources to handle. In all cases, however, keeping the information and scheduling organized is important. 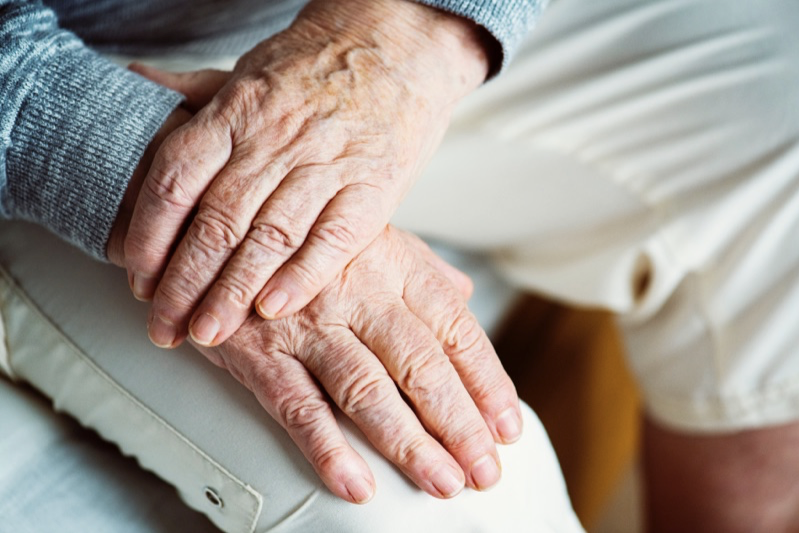 The easier it is to coordinate caregiving, the more energy can go into the care itself and the more time caregivers can free up to get the rest and renewal that they need, too. Here are some ways that Teamup Calendar can be an aid for caregiving. Maybe they can spark an idea for your own situation or organization. You can use a Teamup Calendar to schedule different caregivers, without needing to continually send emails or text messages or make phone calls to confirm the schedule with each person. 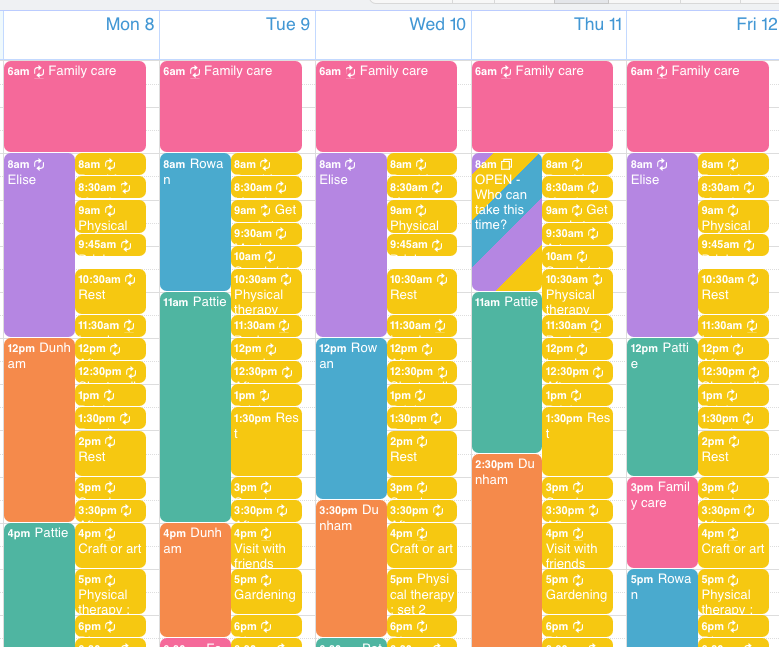 Here’s an example of how you could set up a calendar to schedule caregivers. First, create a sub-calendar for the daily routines, medication schedule, doctor’s appointments, and other relevant activities. You could include physical therapy, reminders, and rest times on this calendar. Caregivers can refer to the calendar when they are ‘on duty’ to see what is needed at any given time. Many times, what is most important is consistency of routine. Having a shared calendar helps all caregivers maintain a consistent routine. Add medication times, daily activities, rest, meals, and other routines as recurring events. Next, create additional sub-calendars as needed. For example, you might need a sub-calendar for the family members, to show when family will provide care. Show each caregiver’s scheduled time on their sub-calendar. 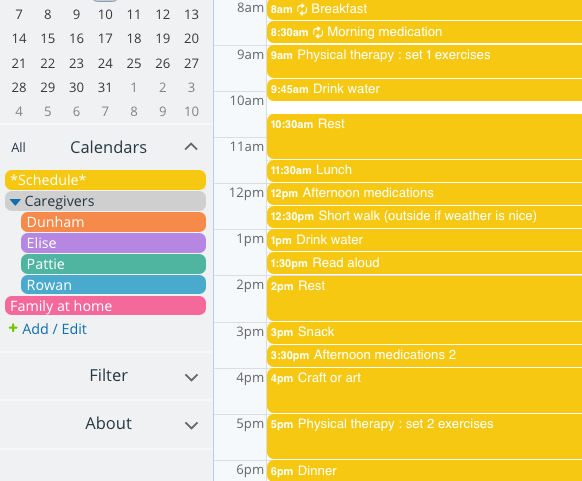 You can create and share a unique calendar link with each caregiver, so they can see the daily schedule, the family care schedule, and their own hours. You can set access permissions as needed for each calendar link. You might allow each caregiver to have read-only access to the daily schedule sub-calendar and other caregivers’ sub-calendars, and give them modify access for their own sub-calendars. 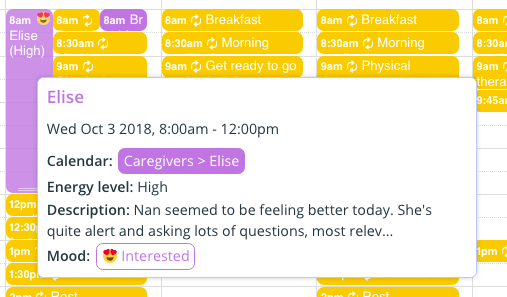 That way they can add notes and details about care to their own sub-calendar. You can use the calendar events to record notes, details of care, mood, food intake, and other important information. When you record this information on the calendar, you can always retrieve it and see exactly what was happening on a particular date. Being able to do this can help you and other caregivers and medical providers see patterns and needs that might otherwise be missed. You can modify an event field, or add a custom event field, to track important details, such as mood or energy level. If each caregiver has modify permission for their own sub-calendar, they can add events and keep notes on their own sub-calendar. Then you can easily see the details of care for each caregiver. Each caregiver can keep notes and record meals, medications, and other important info on the calendar. A shared calendar can also help with keeping track of changes in medication, physical therapy assignments, and other important instructions. You can record notes from a doctor’s appointment, for example, in the calendar event for the appointment. Then you can share that event with all caregivers who need to know that information. Note all relevant information right on the calendar event for easy reference. Keeping medication changes, doctor’s notes, physical therapy, and other activities involved in caregiving right on the calendar helps you keep track of when changes occurred and the effect they’re having. Plus, having it all in one central location–a shared calendar–makes it easier for you to find the information when you need it. You can use the search filters built into the calendar to find events with keywords, such as “doctor” or “appointment” or “medication change” or “therapy session.” And you can easily share the information with anyone who needs to access it, right from the calendar, via the sharing options. If you have an open time and need to schedule a caregiver, you can use your Teamup Calendar to handle the entire process. 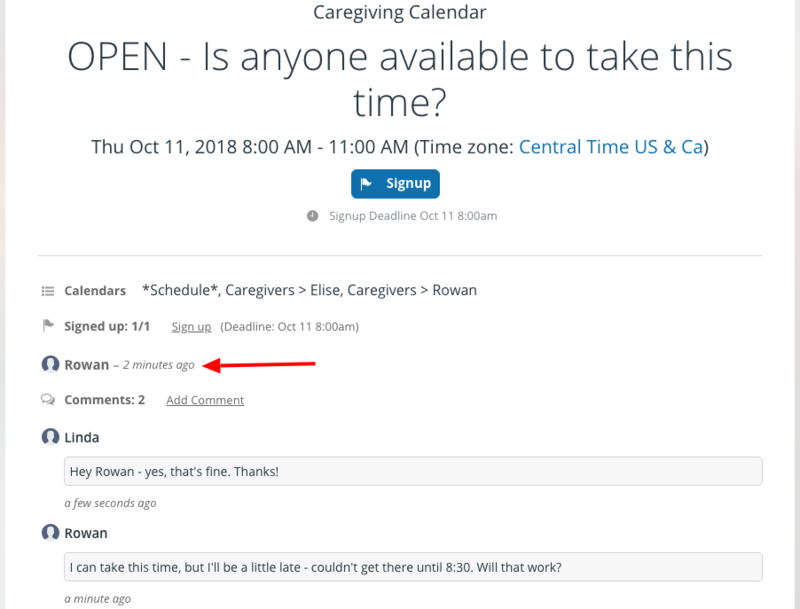 Create an event for the open time, then add it to the sub-calendars of the relevant caregivers. You can share the event as a page to bring it to their attention. With signup and comments enabled, a caregiver can sign up for the open time right on the calendar. You can use comments to work out details. No additional emails, messaging, or phone calls are necessary. It’s an efficient process, all contained in a shared calendar, and easy to reference anytime. Enable comments and signups to easily schedule open times in the caregiving calendar. All the features and examples in this post were created with a Teamup Calendar on the Basic plan, which is completely free. You can create your own free calendar and start exploring the features and possibilities. How could a shared caregiving calendar help you? Caregiving requires a lot of time and energy; it’s truly a labor of love. We hope that the powerful features included with each Teamup Calendar can help you simplify and streamline all that caregiving requires, so you can take time to care for yourself, too.